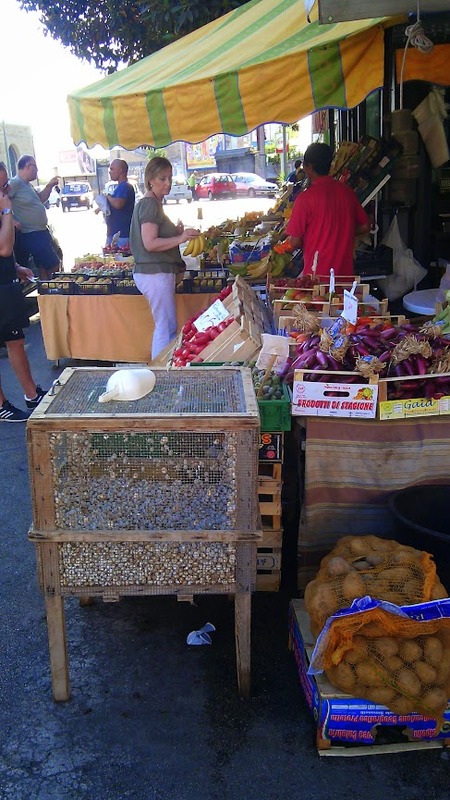 The other day we stopped at the greengrocers – which is normally a roadside stall in Sicily – and my son started making a big fuss over this cage of snails. Most eight-year-olds would either want to play with them or, if particularly sensitive types, perhaps want to liberate them. Not my son. He wanted to eat them. “I don’t know how to cook them,” said Hubby. That was a big fat lie. What he really meant was that he didn’t feel like spending about 24 hours preparing them before cooking them. And indeed he does. 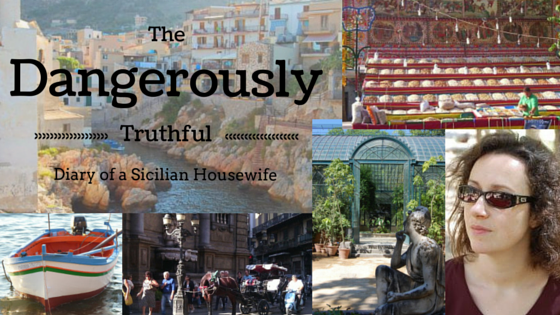 He has prepared them in the past with his Sicilian grandmother, otherwise known as The Godmother. Spending 24 hours preparing dinner is no big deal for The Godmother, of course. She sometimes cooks meals that take several days. “I’ve already bought some meat for dinner today,” said Hubby. “Well put that in the freezer,” said the little lad. “I haven’t got enough money for snails” tried Hubby. This would melt the hardest of hearts. Indeed some bystanders had tears in their eyes by this point, so Hubby bought a bag of snails. 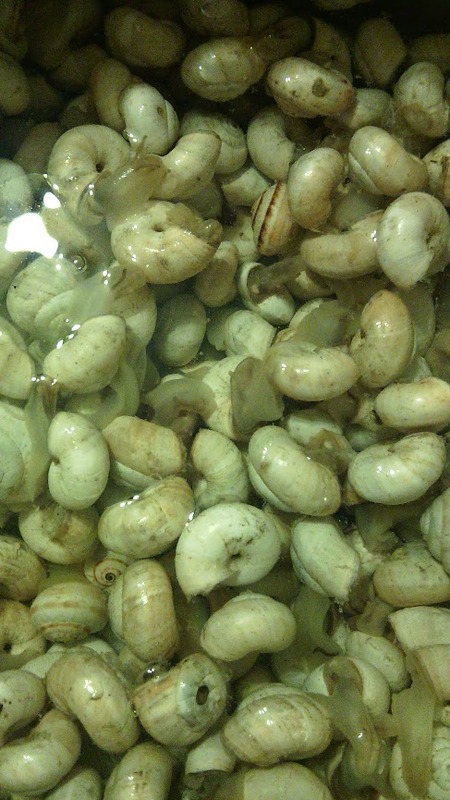 What you have to do with these snails, first, is leave them in water overnight. They all pop out of their shells to see what is going on. At this point you can put two of them on the kitchen work surface and make them race. I wondered if I should say something along the lines of “Don’t play with your food” but, apparently, The Godmother encourages this kind of behaviour. Perhaps it enhances the flavour. Once they have been in water a while, masses of snaily slime floats to the surface in globs. This is the moment when you decide that you are not going to try eating snail, after all; indeed, you are happy to go to your grave without ever having tasted snail. You have to swizzle the snails around and change the water again, and again, and again, and again, and again. The slime just keeps on coming. Whilst you get bored with it, the snails are the ones who are really fed up by this point. They make determined bids for freedom, using what little slime they have remaining to clamber up the side of the container. Once you have washed the snails almost to death (which is probably why The Godmother likes preparing them so much) you can cook them, at long last. This is a complex process which involves frying garlic, adding parsely and then exposing them to heat to kill them instantly. My lad did explain to me exactly how The Godmother does this, but it sounded so complicated that I decided to delegate this step to Hubby. It would be a pity to ruin the snails in the cooking phase after giving them each a thorough bath and massage twelve times. Once they’re cooked, of course, all you need to do is eat them! This involves yanking them out of their shells with a toothpick, then sucking them into your mouth with loud slurping noises. Buon appetito! And in case you’re wondering, no I did NOT try them. Both Hubby and the little lad were very pleased to have the whole lot for themselves. Ugh. So, I tried snails in Belgium this summer. Not my thing. But at least I did it! I’m impressed by your courage! Well done for trying them. Is there anythying you think you just could not even try out? BUGS. All that stuff people eat in SE Asia – the deep-fried larvae and whatnot. I just cant even fathom. Thanks for the laugh you brighten my day. I was in a restaurant with Mrs Sensible and she ordered our meal while I was at the loo. I was impressed with my juicy steak and a little bemused by Mrs Sensible’s kebab. She offered me a piece, not bad I said, what is it? Spiedino di Lumaca. What? Snails on a stick! Barf time..
Must say though, I liked snails better when I was 6 than now. I am amazed that children like them. When I was a kid I just wanted fish fingers and ham sandwiches! The thing I can’t face is the texture, that rubberiness. It’s same thing that makes me squirm at the idea of having sea food like mussels or oysters. I am literally shuddering now to think about it! Exactly the same as my son! Especially cooked by Grandma!!! I’m with you: No, thank you, to snails. As well as bivalves in general, except scallops. The snails still *lived* while you prepared them?! Urrrrgggg noooooo! i babbalucci! the zia (91 now!) 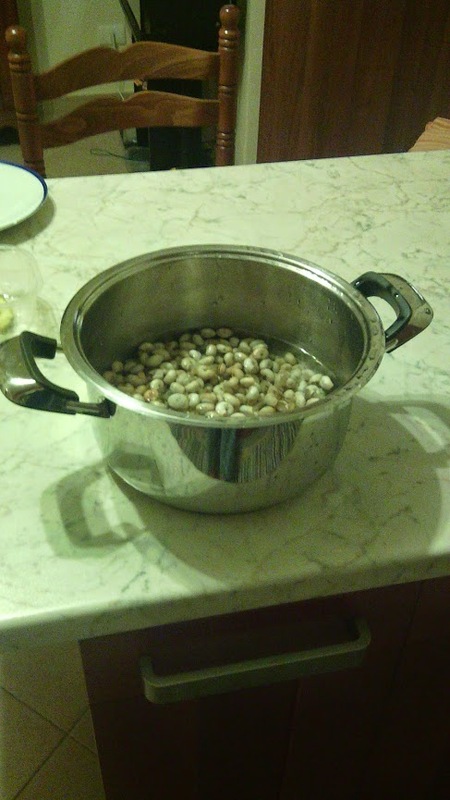 would make a huge bowl of this for her brothers any time my dad came to Sicily…. the 3 of them would hover impatiently while she stood at her tiny stove. one of my favorite mental pictures is of my dad and my uncles, sitting at her dining room table shirtless slurping up the snails from a huge bowl. They would talk loudly, drink wine and my aunt would walk around them, telling them to either eat more, or slow down. oh, and i’m pretty sure that was the market we used when we were in mongerbino this summer. best bread & nice boy who helped l’americana our. I saw family eat snails in a tomato sauce in the village of Ferla. The youngest child, about 8 at the time, pulled them out with a toothpick, popped them in her mouth and did that Italian gesture of kind of screwing her index finger into her cheek…meaning buono gusto…delicious! 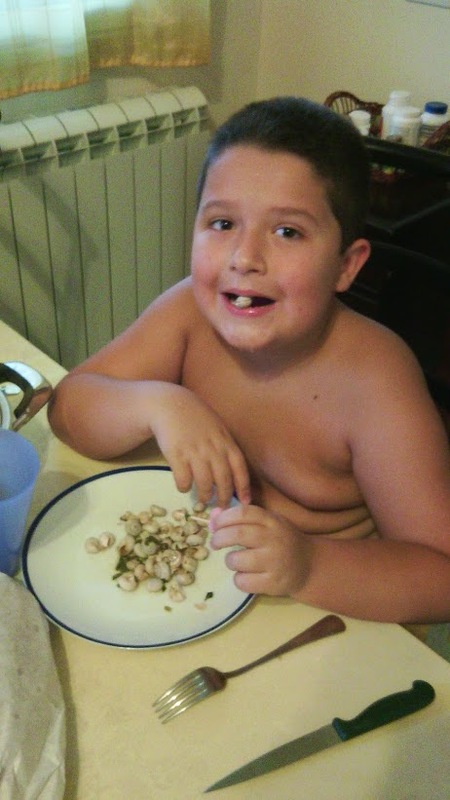 Yep, that’s pretty much what my son does when he gets snails to eat. Funny how all kids seem to love them, isn’t it? Though from my primary school days, I do remember a lot of kids eating bogies, too. Your son is a delight. And he can cook a bit! I don’t remember any snails in the cook pots of my childhood, luckily! But tomorrow I will be spending a few hours preparing Sicilian-style, stuffed, baked artichokes just as my Sicilian grandma did. I will make four – all for me – as my family doesn’t even want to try them. Fine with me – all mine! I eat one a day for four days. Do you guys like shrimp? Or lobster? Well, think about what those really are. Aquatic insects. And most eat the equivalent of what cockroaches and crickets eat on land. So it’s all relative. I would eat insect and larvae without hesitation if prepared correctly. Good points, Marlis, though they make me more inclined to give up eating prawn and lobster than to start eating bugs and snails! I had a prawn phobia most of my life and only managed to try one about 5 years ago. It was actually my son who stuck it in my mouth!! I’ve been a cheating vegan for a number of years but after this post I’m never cheating again, promise! 😀 Glad to have been of service!!! And just wait till you see the article about what my mother in law did to my attempt at an English Christmas dinner…. I make a point of trying as much interesting food when I can, so I’ve eaten frogs legs in France, donkey and horse in Italy, locusts in Thailand, and whale in Iceland, but the worst thing I’ve EVER tried was raw shark ‘cured’ in rancid milk in a barrel buried underground for a year. It was so foul I had taste ‘flashbacks’ for several months after and could become nauseous at the drop of a hat. At the same meal I had sheep’s head off the skull and beef cured in urine. They seemed nice by comparison. But I still don’t fancy snails! And may I just add, again, Good heavens!!!!!!!!!!!!!!!!! That was in Iceland too. It’s part of an annual feast called Thorrablot (or something like that). It seems to be some kind of Viking revival testosterone-fuelled repulsive eating challenge. And the alcohol in Iceland is so prohibitively expensive that I don’t think we got any kind of moonshine to dull the senses. The nicest part of the meal was dessert, plain yoghurt with blueberry compote. I then looked up at the mural of seabirds on a cliff and realised it looked just like a giant bird poo and the last hope of any kind of culinary pleasure evaporated entirely. By the way, oysters are delicious, sort of silky in texture, and not rubbery, and come way below furry bananas on my personal repulse-o-meter. I like them with very finely chopped shallots and sherry vinegar. Yum! OK, you’ve convinced me to give oysters a try next time I see them. 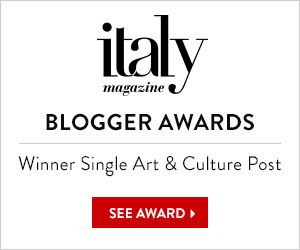 They don’t seem to be very common in Sicily, though. I have read that everything in the whole of Iceland is testosterone-fuelled Viking macho nonsense. I didn’t realise they carried it as far as food, though. The seabirds pudding analogy has got me laughing like a hyena! I don’t mind trying something at least once, but I draw the line at snails. The reason? Snails used to be pests in our garden and our job as children was to eliminate them, something we really enjoyed. Snails would usually come out late afternoon and head for the garden. We would turn them over and sprinkle salt on their flesh. They would melt into a gooey mess within a couple of minutes and that was that. It was very effective. So, that is all I remember when I see someone eating snails and I can only imagine how delicious they must taste. Ha ha! When I was a child, my mother used to send me and my sister into the garden to get rid of snails too, because they ate the vegetables and her pretty flowers. We didn’t have the heart to kill them though. We used to throw them with all our strength into the neighbour’s garden when he wasn’t looking. I am pretty sure he was doing the same thing to us, though, because no matter how many flying snails passed over the fence our garden was always full of them! Snails when prepared well are sooo good! Had them in France last spring. I would definitely have them again. I don’t think I would like preparing them though that sounds a bit too much for me.